This book is going to my dear Giz who is true angel indeed! Adult/High School–Four different people find themselves on the same roof on New Year's Eve, but they have one thing in common–they're all there to jump to their deaths. A scandal-plagued talk-show host, a single mom of a disabled young man, a troubled teen, and an aging American musician soon unite in a common cause, to find out why Jess (the teen) can't get her ex-boyfriend to return her calls. Down the stairs they go, and thoughts of suicide gradually subside. It all sounds so high concept, but each strand of the plot draws readers into Hornby's web. The novel is so simply written that its depths don't come to full view until well into the reading. Each character takes a turn telling the story in a distinctive voice. Tough questions are asked–why do you want to kill yourself, and why didn't you do it? Are adults any smarter than adolescents? What defines friends and family? Characters are alternately sympathetic and utterly despicable, talk-show-host Martin, particularly. The narrators are occasionally unreliable, with the truth coming from the observers instead. 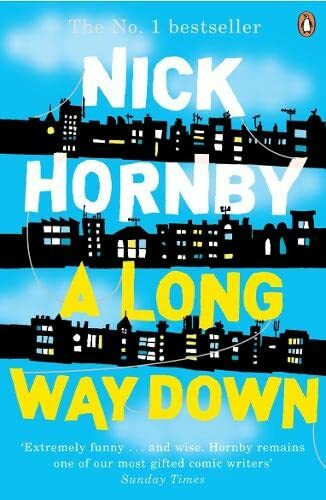 Obviously, a book about suicide is a dark read, but this one is darkly humorous–as Hornby usually is. Teens will identify with or loathe Jess and musician J. J., but they will also find themselves in the shoes of Maureen and Martin. This somewhat philosophical work will appeal to Hornby's fans but has plenty to attract new audiences as well. I am sending this to KarinAlyssa as her Inklings book (I'm playing catch up) so Karine, I know you will enjoy this. I think it may be his best so far. I received it about a week ago but had computer troubles, so I'm only journalling it now. Thank you El for sharing, I can't wait to read it as Nick Hornby has been one of my fave authors in the past years ! 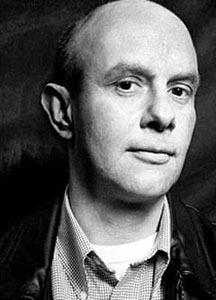 A charming book written by the great Nick Hornby, thank you so much for sharing El!